Halloween is just around the corner – exactly one week to go – not to mention all of the festivities that will undoubtedly be going down this weekend! And with midterms still raging, we thought you might be a little behind on your costume preparation, so we’ve picked a few of our favorite fashion-inspired costumes and rounded up the goods for you! 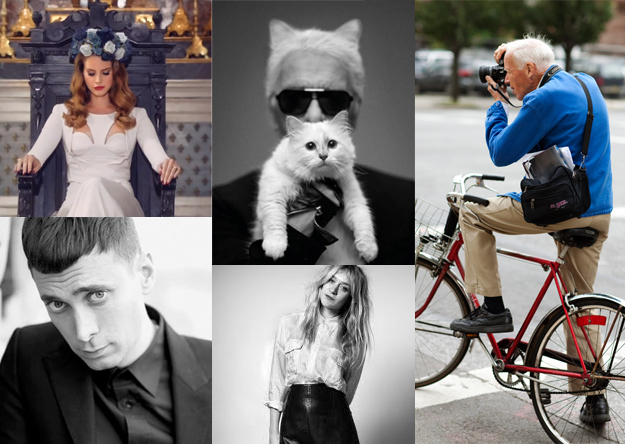 Follow the jump for tips on dressing as your favorite fashion influencers, from street style original Bill Cunningham to the industry’s most pampered pet Choupette! 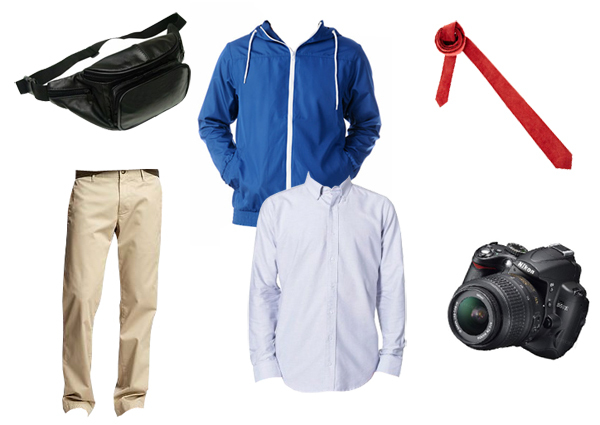 Our first costume – everyone’s favorite street style photographer – Bill Cunningham. Lucky for us, Bill sticks to a relatively simple uniform, making this get-up a no-brainer. To start, the basics: a light blue oxford shirt, khaki trousers, and that oh-so-recognizable blue jacket. And for his accessories: a skinny red tie for fancier occasions (it is Halloween after all), a fanny pack for the essentials, and of course, it wouldn’t be Bill without his camera (for monetary purposes, we think any old camera will do). And there you have it! And next on our list, the sultry songstress Lana Del Rey. She may not be part of the fashion industry per se, but there’s no denying the girl has got a look – and is therefore perfect costume material. We’ve already taught you how to emulate her signature tresses and retro beauty, but now we’ve got the rest of the ensemble for you too! We’re taking inspiration from LDR’s “Video Games” music vid – for which you will need a stunning white dress and white heels to match, a bountiful blue flower crown, and a religion-inspired ring – worn subversively of course. Cap it off with red nail lacquer and matching red lips and you’re good to go! To go out dressed as the only feline with her own magazine spread (thank you Grazia!) – the one, the only, Choupette – it’s all about white. To form the base of your costume, we found this stunning vintage Geoffrey Beene white fox fur coat. Yes it’s pricey, but if you’re playing the world’s most spoiled kitty, you’ve got to act the part. 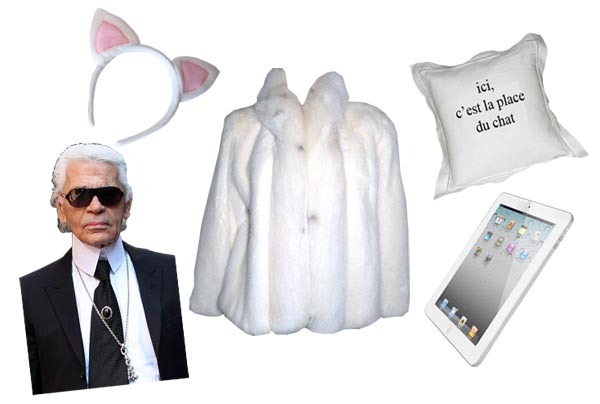 Next you’ll need a pair of ears, your favorite toy, an iPad – in white of course, and a Karl Lagerfeld (a.k.a. Daddy) look-alike to cart you around all evening. The final piece of the puzzle, a pillow that marks your place (customizable on Etsy). This can be left at home until you decide to rest your head, or taken along for the ride in case you’re in need of a quick cat nap. To dress up as Saint Laurent Paris’ new creative director Hedi Slimane, you just have to think black and really, really skinny. The basis for the costume is a pair of super skinny black jeans, and of course this pair, designed by the man himself, are as skinny as they come. And on top, a classic white button down and black jacket combo, accented with the skinniest of black ties. 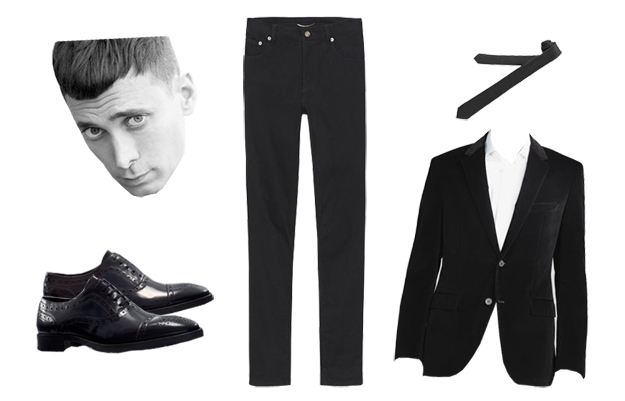 Black oxfords are Mr. Slimane’s footwear of choice, and we think this pair is perfect. The hardest part of the costume is that signature one-eyebrow-raised look that he does so well. This can’t be bought, and might take some practice, but is essential to completing the look. And lastly, indie-fashion’s favorite darling, Chloe Sevigny. Chloe always has a serious ’90s thing going on, which we can totally identify with. 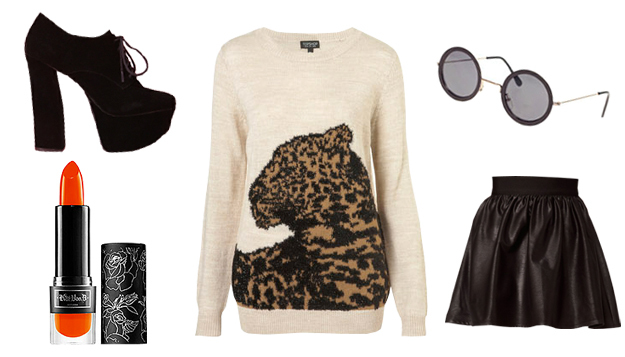 She loves leopard print, so we took it one step further and picked out a leopard-emblazoned sweater, to be paired with a black skater skirt, and a pair of sky-high platform oxfords. Accesssories for the evening include some John Lennon-inspired sunnies and a bright orange lip for the perfect pop of color. And for this particular costume, we’ve got one last bit of inspiration to really help you nail it – a lesson on posing so your pics are just right (thank you Rob Curry for passing along this vid!). And there you have it – hope we’ve made your Halloween prep a little bit easier!